Will networking on social media sites help to build your career? In this day and age it seems like everyone and even everything is on social media. Corporations, small businesses, and professionals are no exception to this trend and should be used to your advantage when it comes to looking for a job and expanding your professional network. Even as recently as 10 years ago, professional networking meant asking an acquaintance to hand deliver your resume to an HR manager or cold-calling a company for a meeting. Now with social media, you have the ability to make hundreds of professional connections in the click of a mouse. In this blog, you’ll find tips on how to make those connections initially and how to keep them going. First, let’s talk about the hidden job market. Many job openings exist in the minds of directors, vice presidents, and other company “bigwigs”, long before the job is actually advertised to the public. If you can present yourself as the perfect candidate at an early stage via social media networking, an employer may snap you up without looking elsewhere. Second, keep in mind that recruiters and potential employers now use social media to screen applicants. We will talk more about this later but do not underestimate the importance of putting your best foot forward when it comes to your public social media self. Build compelling, professional profiles for yourself that include your job history, experience, and education. Some people even create separate accounts for their personal and professional selves. Third, social media is quickly becoming a hugely popular marketing realm. This means that companies have an active presence on social media now more than ever. Use this as an opportunity to not only learn everything you can about the company you want to work for, but to also interact with them. Follow them and set up alerts for when they post so you’ll be first to know about new products, services, and job openings. You are a Recent Graduate. Now what? You’ve done it! You’ve finished college and earned a degree or diploma. Congratulations! You’ve worked hard to get that supposed “fast-pass” ticket into gainful employment. That degree or diploma will open doors to that dream job with great pay and you’ll live happily ever after. Yes! That can all be true, but you have to have the right job search strategy to make it happen. Below are some pointers to help you get started in making that first step onto your career path. First, take a reality check. This is an exciting time; full of potential and aspirations. But, if you’ve been a student, living in a university environment, with professors and tests and a three-week holiday break; your whole world is about to change. Acknowledging that reality and learning about the world you’re about to venture into may help soften the blow. Prepare yourself by learning as much as you can about what it’s like to actually work in your chosen field. Professional networking is a vital component of building your career. These days networking almost doesn’t happen without harnessing the power of social media. As a recent graduate, you’ll need to establish a professional presence on social media. A professional presence is somewhat different than the purely social or academic presence you may already have. Having your own “professional brand” on social media will work to your advantage when it comes to expanding your professional contacts, researching career options and finding a job. These early connections can prove to be immensely valuable throughout your career. You may be familiar with the saying, hang out with the people who are what you aspire to be. This saying holds especially true for the new grad as you start to network on social media. There are numerous social media outlets available to help you associate with people already doing what you want to do. Networking in any capacity is an active task. It can be tedious, feel awkward and even be a bit scary, but you can’t sit idly by and expect contacts fall into your lap. Some people will ignore you, and that’s okay. Reaching out and being ignored is far better than not doing anything and hoping the connections come. Stick with it and you’ll find there are plenty of people on professional networking sites willing to offer advice and provide guidance. All you have to do is start making connections, then start some conversations. Networking can help you meet the right people which can lead you to learning the right things. When possible, meet with people face-to-face. A face-to-face meeting allows you to have a full communication experience through body language, eye contact, and tone of voice which helps to establish rapport, build bonds and cement stronger relationships. It also affords you practice for that really important face-to-face, the interview. As you interact with your new connections, ask a lot of questions and try to understand their career journey. Why did they choose this field? What did they expect when they graduated? How did they get to where they are today? Are they on the same path they started out on? Even though you’ve graduated college, your need to learn has not diminished. Also, notice that none of these questions are direct questions about you getting a job or how much money is earned. These questions are more about you learning and preparing for what you want to do in the future, long-term and less about your immediate need for a job. Speaking of immediate need for a job… The next pointer is, find a job. It may not be your dream job, it may not be connected to your major, or even require a college degree. But aside from the fact that having a job provides income, albeit not the income you’re shooting for, it is one of the best ways to get a feel for the “real” working world. Perhaps you’ve already been able to do some internships in your chosen field. Even better! You’ve got a head start! Just the mere fact of having a job, even if it’s not in your chosen career path teaches you things. Basic lessons on being a good employee such as, being reliable, taking direction, interacting with team members. Plus, it gives you a taste of dealing with some more complex aspects of working like collaborating with peers, recovering from mistakes and taking responsibilities. These are invaluable lessons that will serve you well as you travel your career path to do what you REALLY want to do. If you’ve taken the time to build some professional connections, you can use your newly formed network for advice on navigating some of these challenges. You should understand and follow the generally accepted basic rules for professional networking. You’re working to build a professional reputation here. You need to remember that recruiters and potential employers now use social media to screen applicants. It’s increasingly common for employers to check out not only your professional social media profile, but also your Facebook, Twitter, Instagram and any other place your persona exists on the internet. So be mindful and clean up if necessary, your whole social media repertoire. It’s especially important to follow-up after someone has provided advice. Expressing your thanks is a simple step that many people miss. People like to feel helpful, so let them know if their advice was useful for you. Looking for Employment or looking to change Employment? As a job seeker, it will benefit you to know that social media and networking can help you market your skills and achievements to improve chances of being selected by an employer. Perhaps you have spent years in a job where you feel you are not progressing like you would like and you need a change or you lost your job after years of faithful service. In both cases, as a job seeker, it will benefit you to use social media in your job search. We understand that if you’ve been out of school and/or the job search world for several years, you may not be well versed or confident in how to use social media. You may even feel like it is a tool for the newer generation, and you would prefer to use the job search methods you are comfortable with. However, the job-search world has changed, and for the better. Don’t look at social media as a bad, unnecessary or even intimidating thing. Once you begin to learn the ropes, you will quickly find that social media and networking can help you market your skills and achievements to improve chances of being selected by an employer. It will not only allow you the availability of communicating with businesses or individuals in your desired field, it helps you to portfolio your accomplishments and experience as you grow in your career and even future job changes. The benefit of continued professional Social Media Marketing during the Passive and Active Job hunts. Everyone has experienced it: you find that your day-to-day work is becoming more and more mundane. Now is not the time to sit back, and let your professional social media brand cruise on autopilot while you await new opportunities and hope for the best. It’s time for a new role, and your social media strategy during this time is more important than ever. Staying active and relevant on professional social media platforms is the best way for continued career progression, whether during the passive or active job search. People prefer other people that they have seen before. This principle is the main reason why professionals must maintain their social media presence, even if they are not actively looking opportunities. If your career progression is within an industry where eventually working for a competitor is a very real possibility, you can set yourself up with those future employers even while they’re still competitors. By reaching beyond your immediate organization for leaders and innovators in competing organizations, inviting them to your network, and then posting content that will appear on these potential employers’ feeds, you have already surpassed a candidate who has not exposed their name and their professional brand across these same industry professionals. The more familiar people are with merely your name, the more they’ll like it, so don’t let yourself go quiet. By making yourself available on social media for recruiters to review your skill set and achievements, you are creating a brand for yourself. In addition to your full name, you should have a consistent photo across all your professional social media platforms. People should be able to know who you are and what you can do in your field. The benefit of having an online visual career portfolio can be instrumental in maintaining your brand image. Having summarized details about your professional work history and marketable skills online can give you an edge that those who only use paper resumes don’t have. At this stage in your career, you have taken the time to develop a consistent, professional, goal and value-driven social media brand. When your professional image becomes so easily accessible by employers, the need for maintaining it is very high. Follow the relevant companies or individuals who heighten your chances of visibility by the right recruiters. Do not start posting content irrelevant to your employment goals, or content that doesn’t match your values. Your colleagues, peers, and superiors will pick up on any insincerity, and experience that uncomfortable feeling of dissonance. This feeling will definitely translate into future assessments of your hire-ability, and impact the final outcome of your application. Always post material that is consistent with how you market yourself professionally. 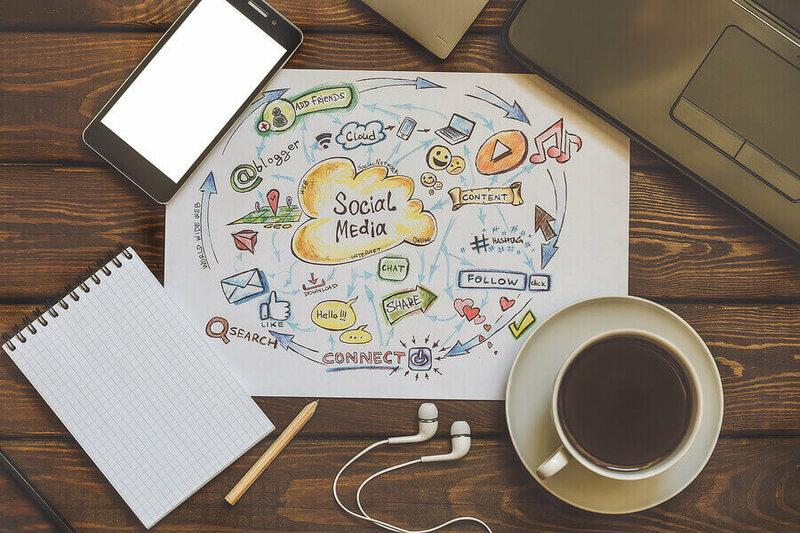 Whether looking actively to shift careers, or just passively monitoring the industry, staying active and relevant in your network is the easiest way to develop a fundamental social media marketing strategy that will project you to your long-term goals. Hopefully the above pointers will give you a good start. Always remember that professional networking is a marathon. If you follow the pieces of advice above, you’ll find that there are ways to make it a fun race to run instead of something boring and monotonous. In fact, it can actually be a lot of fun and help you move you forward in your career.